There's a rocket launcher hidden somewhere in there, too. Makeover Droid: Where were you hiding that [gun]? Captain Jack: [still naked] Ladies, you really don't want to know. — Doctor Who, "Bad Wolf"
Any weapon hidden in a creative place on a person's body. Not the same as a Victoria's Secret Compartment or Trouser Space. If the weapon is stored around the belt area, the trope you're looking for is Pants-Positive Safety. Perennial favourites are the Little Useless Gun and the Butterfly Knife. If there are lots of them, Extended Disarming may ensue. See also Hyperspace Arsenal. Arsenal Attire and its subtropes, for when weapons are incorporated into clothing rather than simply hidden within them. Chastity Dagger, if a woman carries one specifically to defend herself against rapists. Nothing Up My Sleeve, weapons hidden under sleeves (especially if they're longer than the person's arm itself). Trench Coat Warfare, if they are guns and are hidden beneath a long coat. Not to be confused with Emergency Weapon, a videogame trope. Compare This Banana is Armed (weapons hidden in innocuous objects) and Shoe Phone (gadgets hidden/doubling as innocuous objects). In InuYasha, Sango has a blade weapon concealed in her armguard, which comes in handy on numerous occasions when she is disarmed of her primary weapons. Mihawk of One Piece wears a small knife as a necklace. Hidden Weapons specialist Mousse from Ranma ½ keeps an innumerable amount of weapons stored on his person, whether simply tucked away inside his robes (ignoring such little things as bulk, size, and weight of the objects, which neither hinder him nor give themselves away,) snapped into the soles of his shoes, or even a length of cutting wire carefully rolled into the frames of his glasses. In one of the movies, on the beach, Mousse was without his trademark robe and still managed to pull it off, hiding massive chains within his swimsuit's wrist bands. Before Mousse there was Ryoga. He wore a massive number of bandana's which he could use as razor sharp projectiles. His bamboo umbrella weighs several tons and has razor edges, and even his belt can be snapped straight and wielded like a sword. However Ryoga's arsenal was passed over after being overshadowed by Mousse, and he mostly became a straight fist fighter focusing on unusual strength and endurance. Saruhiko Fushimi in K carries over 20 throwing knives. The first time he visits Scepter 4 headquarters in a prequel novel, he turns over two of them when asked to disarm, and the Blue King, Reisi Munakata, enters at just that moment - this is the first time they meet - and tells the guard that he knows Saruhiko has more knives than that. He lets Saruhiko keep the ones in his shoes. Saruhiko ends up defecting to the Blue Clan, and becoming Reisi's most devoted Clansman. 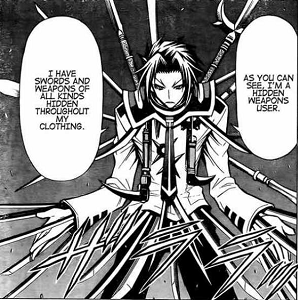 Pictured above, Kei Munakata from Medaka Box has a style based entirely on hidden weapons. Swords, hammers, knives, handguns, grenades and even rocket launchers are always on his person and he can pull them out incredibly easily. Lord knows where he actually keeps all the damn things. Emi Isuzu from Tenjho Tenge is a ninja style character with dozens of throwing weapons hidden on her person. She's actually very overweight and controls her appearance with a body manipulation technique that hides her weapons in her scrunched up fat folds. In Bleach, during Yoruichi's fight with Soi Fon she shows that she has several throwing knives concealed in her pant leg, which she throws by kicking at her. Agnieszka from Kurobara Alice has a necklace that hides a tiny knife in its medallion. It was given to her as a gift. Which she uses to commit suicide. Otowa Hyoko, one of the minor villains from the last story arc of Rurouni Kenshin, has 13 assassination weapons hidden on his person at all times. He openly admits that he's not a warrior of any kind, since his fights never last longer than it takes to throw a cloud of poison gas or shoot a dart into a person's spine. Many characters in Itsuwaribito use them a lot since being an itsuwaribito means being a person with the qualities of a thug, a thief, and a trickster, and hiding their Weapon of Choice is a common tactic they use to get the upper hand in a fight. Utsuho's various explosives and Choza's poisoned hand claws are the two most prominent examples among the main cast. Juuzou Suzuya in Tokyo Ghoul :Re has dozens of knives hidden in his prosthetic leg. This comes in handy, when a mission requires him to go undercover as a victim of a human trafficking ring. Obi always has a knife visible at his belt, and after starting to work for Zen adds another dagger to his belt, but he is always carrying far more hidden knives than that and keeps several kunai up his sleeves for easy access. Kiki carries a hidden knife in addition to her sword, even when she is at one point forced to dress according to her station as a noble and leave her sword behind. In Brave10, every ninja has at least a few kunai hidden up their sleeves, if not thirty. The most unlikely hidden weapons users are Rokuro and Nanakuma, who managed to produce suntetsu, combo whips/rope darts, and daggers from within and out of their stripperiffic outfits. Tex Willer Kit Willer wears a scabbard containing a hidden knife on his back, right under his neck. It does save his life from an arrow. Lucky Luke: A one-shot gambler villain (parodying Louis de Funès) has to be disarmed several times in the span of a few minutes, because he kept pulling out increasingly smaller Derringer guns from various parts of his person, including one from his ear. Bat Lash keeps a derringer hidden in a pocket watch case. One at least one occasion when an opponent gets the drop on him, he takes out the 'watch' so he can note the exact time of his death, and shoots the gunman with the derringer. A Growing Affection has Shino teaching his artificial leg to hold a pair of kunai. And Hyouta Hyuga keeps a pair of holdout kunai tucked in the sleeve of his formal robes. In Prison Island Break, the Knife Nut Shadow the Hedgehog consistently conceals prison shivs about his person. It's a mystery as to where he hides them all, only that whenever he is shaken down, several are removed, and when he gets back into his clothes, he still manages to come up with some more very shortly later - not knives, but items rapidly fashioned into sharp blades. At one point, he produces a shiv while entirely naked. Dragonfang in Master Potter of Kamar-Taj is able to turn invisible, allowing Harry to keep it a secret from the school before Percy Weasley literally stumbles upon it. In Back to the Future Part III, Tannen attempts to assassinate Doc with a tiny Derringer pistol concealed under his hat after his primary guns are confiscated. In Braveheart, when pretending to hand himself over to the local English garrison, the hero hides a flail behind his back which he then pulls out to start his Roaring Rampage of Revenge. Near the end of Die Hard, John McClain goes to confront the bad guys by feigning surrender and dropping his submachine gun, and then defeats them with his Beretta 92 pistol, which he had secured to the back of his neck with duct tape. In Django Unchained, Django and Schultz keep tiny Derringer pistols in their sleeves as backup guns and use them with devastating efficiency on a few occasions. Buster Keaton, in Our Hospitality, demonstrates an early example of this. While visiting his beloved's family, he reveals a large number of pistols concealed on his person. Rush Hour: In addition to his Beretta 92 service pistol, Carter keeps a Smith & Wesson model 36 backup gun concealed in an ankle holster, which plays a crucial role in his fight with The Dragon. In True Lies, Agent Faisil poses as a reporter to infiltrate the Crimson Jihad after they have taken over a building and kills several of them with a H&K P7 pistol hidden in his video camera. In Baccano!, Nice Holystone hides a small bomb in her empty eye socket beneath her eyepatch. In A Certain Magical Index, Kuroko Shirai keeps a number of weighted needles on garters just under the edge of her skirt, which are used in conjunction with her teleportation abilities in order to pin opponents to the ground. She also has some larger bandoliers of said needles that she sometimes digs out when subtlety has stopped being important. In Durarara! !, Anri's demonic blade, Saika, is living inside her body and most Saika children and Kasane Kujiragi, one of the wielders of the true Saika who actually split the true Saika blade in half which the other half was now currently in Anri's possession are also hidden in their bodies, althought their Saika blades are usually in different weapons than Anri's katana. In A Brother's Price every member of the Whistler family is heavily armed,though not all weapons are hidden. Jerin, as a boy, would not normally be armed, so people are quite surprised that he has a gun. And a dagger. And some lockpicks. There's a scene in Cryptonomicon where one of the characters spends two pages removing various weapons from holsters all over his body so he can lie down comfortably. Justified in that he's a Marine in a combat zone, but pretty funny nonetheless. The Assassin guild members in Discworld are frequently described as having weapons concealed all over their bodies, to the extreme that, when someone menacing gets near, everyone starts revolving in their clothes. In Pyramids, Pteppic tries carrying so many hidden weapons for his final exam that he ends up having to get rid of some so that he can actually walk to the exam in the first place. Dragaera: Vlad Taltos stashed an absurd number of weapons on his person when he still worked as an assassin. Once after waking up in captivity, he smugly notes that his captors changed his clothes entirely rather than try to figure out if they'd really found every last weapon while disarming him. He also tended to switch out his weapons weekly, to make it harder to magically trace any lost ones back to him, which could take an hour or more to get everything in place just so. Mirtai in The Elenium is shown to always be armed. Even at Ehlana's wedding, the narration specifies that she was "not visibly armed" when participating in the ceremony. Two of her weapons deserve special mention: the first is the spoon that she acquired after being Made a Slave in childhood, of which she sharpened the handle and used to ensure she wasn't overly mistreated. She keeps it in adulthood out of a mix of sentimental attachment and use as an unexpected desperation attack. The other is the pair of knife blades she planted into her boots so that only the tips stick out. Not lethal, but anyone on the receiving end of a Groin Attack will be even more disabled than usual. In The Gardella Vampire Chronicles, Victoria's hairdresser hides her stakes within her hairdos, for easy access. In later novels in the series, Honor Harrington has a hold out blaster built into her (artificial) arm. It's one use as firing it takes the top of her finger off. In Yulia Latynina's Inhuman, the Villain Protagonist hides a gun-like mechanism that fires a diamond bullet in his semi-prosthetic leg when going to assassinate an otherwise Crazy-Prepared Evil Prince (this being a distant future where projectile weapons are considered obsolete). It works. The Ninja Handbook details that one of the prerequisites for becoming a ninja is to make a flesh pocket to hold "Weapons, spare change, and occasionally a sandwich." Lazarus Long is known in-universe to be a master at this. Usually favoring full Scottish garb for the sheer area where one can hide all sorts of surprises, one scene in The Number of the Beast has him strip searched almost to the point of a cavity search and remarking in his own head that he still had one holdout. Admiral Harper of Open Blue keeps a court sword in his walking stick. Said walking stick also happens to be made of some pretty hard stuff, and so fares well as a Simple Staff. Flottenadmiral Nimitz from v2 - v4 keeps a dagger in the sole of his boot. One scene in Shogun has Blackthorne, prior to acting as a distraction in the plan to liberate Toranaga's ship, borrow a few knives and start stashing them under his belt, strapped to his arm and so on. The surrounding samurai seem vaguely appalled. Later he's visited by Friendly Enemy Rodriguez, who he orders searched, turning up knives and pistols hidden in his boots, sleeves, pockets and even in the band on his hat. Nymeria Sand from A Song of Ice and Fire, who specializes in hidden blades. She is one of the Sand Snakes, a group of action girls from the region of Dorne and is said to be able to conceal a dozen daggers on her person. Star Wars Legends: In Allegiance, Mara Jade keeps a hold-out blaster in a tiny holster in her boot. She keeps one up her left sleeve at almost all times. Very common in The Wheel of Time books. The series has a number of knife nuts and they are all carrying knives in every place they can hide them. Perhaps the best example is when the Aiel force Mat to disarm, and watch him sigh and divest himself of 14 daggers hidden in various places on his (not overly clothed) body. Even the Aiel are impressed. Blake's 7. Dayna (whose father was a weapons designer) has produced microgrenades from her boot ("Volcano") and a tooth ("Ultraworld"). On a couple of occasions reality goes out the airlock when she produces a small wheeled remote-controlled bomb from nowhere at all. Doctor Who: In "Bad Wolf", Captain Jack Harkness pulls a gun out while completely naked. His assailants ask him where he got it from, to which he replies "You really don't want to know" before shooting them both. Stargate Atlantis: In "The Hive", when the heroes have been captured by the Wraith they need to activate a door panel located across the room from their prison cell. Ronan produces a dozen throwing knives after he's already been strip searched by the enemy. John: How many of those do you have? Ronan: How many do you need? Twin Peaks: When Agent Cooper and Sheriff Truman are preparing to go to One-Eyed Jack's after being asked to ransom back Audrey, it's revealed that the group currently running the place is planning to kill Cooper. The blonde haired guy has a hidden switchblade fixed to his wrist, almost exactly like the ones used in Assassin's Creed. In Capcom's unreleased Kingpin, Trixie, the Moll of the mob boss, has a small pistol holstered to her leg beneath her dress. GURPS: Ultratech has the Finger Laser, it's fitted beneath the first layer of skin at the end of the finger. And to really shock people you can install a Ripsnake, which comes out of your mouth; the game advises using it while kissing someone for maximum effect. Cyberenhancements being avalaible generally allow an enterprising individual to do a full array of these tricks. Realmslore has a twisted case : a wizard detective carrying a pair of sword scabbards. But there are daggers inside, and the leftover space is used to stash two wands per scabbard. Blood Bowl players with the 'Stab' and 'Weeping Dagger' Extraordinary skills (such as Dark Elf Assassins and Skaven Gutter Runners respectively) are able to sneak knives of various types onto the pitch to use during a game. Unlike the bombs, chainsaws and steamrollers used as secret weapons by other players, these knives are easy to conceal from the gaze of the referee and so their use will not get the player sent off for using them during the game. In Necromunda skinbladesnote known simply as concealed blades during 1st and 2nd Edition are small knives that can be concealed beneath a ganger's skin. Hidden from all but the most intensive of searches, a character with such a blade is able to use it to mount an escape attempt if they are captured by an opposing gang. Many characters in the Assassin's Creed series use one or two hidden blades, a bracer on the wrist with a retractable blade used to discreetly stab targets. Starting with the second game, these hidden blades become increasingly elaborate, incorporating a dart gun, a pistol, blades designed to inject poison, and a hook-blade used for both climbing and combat. In Fallout: New Vegas, the player can hide certain weapons on their person when going into places where weapons are confiscated, mainly the three casinos on the Strip. These holdout weapons are limited to small weapons like smaller pistols, knives, knuckles, and certain small grenades. With 50 Sneak skill they can hide weapons that are on the "improved holdout weapons" list, which includes full-sized pistols, larger bombs, land mines, and even certain types of Power Fist. A Running Gag in the Sam & Max series, with Max and his Lugers. His example is especially noteable as Max doesnt wear clothes, and yet is seemingly able to materialize a new Luger at will. Max himself simply answers this question with "none of your business", and when Sam is briefly in control of Max's body, he apparently discovers where he keeps them, but doesn't tell the audience. RWBY - Mercury Black appears to have guns hidden in his boots. In actuality, it's his modified prosthetics concelled under his pants and boots. Could also apply to Yang, her gauntlets looks just like metal bracelets in compact mode. Tower of God - Yeongsook's many rings are actually fire wands, not mere accessories. The Girl Genius paper-dolls for Gil feature, according to the tailor-bot, "a panoply of hidden weapons for vicious backstabbing". Phil and Kaja, of course, say they don't see any. In an early strip of Schlock Mercenary, when the team is 'disarmed' on the way to collect payment, Schlock is stated to be unable to talk due to a mouthful of concealed weapons. Later, Tagon agrees to let Tailor make him some new clothes when told he will be able to conceal 6 to 10 additional weapons. Olivia, a one-time character on Family Guy, and a Distaff Counterpart to Stewie, has a knife blade hidden in one of her shoes that she uses during a fight with him. Stewie himself has a butterfly knife strapped to his ankle. Parodied in an episode of The Simpsons, in the episode The Simpsons Tall Tales, where a riverboat full of gamblers are pulling out derringers from various parts of their person, including one guy who pulls out a derringer and then removes a SMALLER derringer from the gun barrel. A necessity for Jedi in Star Wars Rebels, as they live in the time of the Empire and openly carrying a lightsaber is certain death. Ezra built his lightsaber to look like a blaster, while Kanan keeps his in a disassembled state to hide its true function.